The analysis of high boiling organic substances may cause Problems in many cases. The IATROSCAN MK-6s offers with the combination of thin layer Chromatography and FID (MK-6 additional with FPD) interesting perspectives. The MK-6 with the Flame Photometry Detector makes it possible to Analyze also Phosphorus and Sulphur. 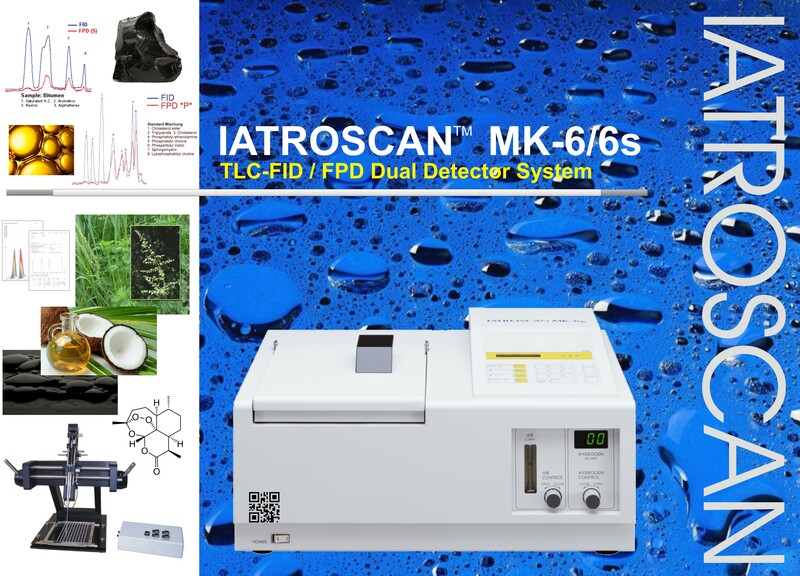 The TLC / FID ( -FPD ) Analytical System IATROSCAN MK-6(s) can be used in many different application fields like Plant Breeding, Forestry, Fishery, Crude oil and carbon industry, carbon products, biochemistry, biotechnology, pharmaceutical industry, environmental pollution, food industry and so on. The advantages of the IATROSCAN System are: ð it is possible to work with up to 10 Chromarods® at the same time, ð many application fields, ð the Chromarods®are reusable up to 100 times, ð 20-30 minutes analyzing time (depending on method) . 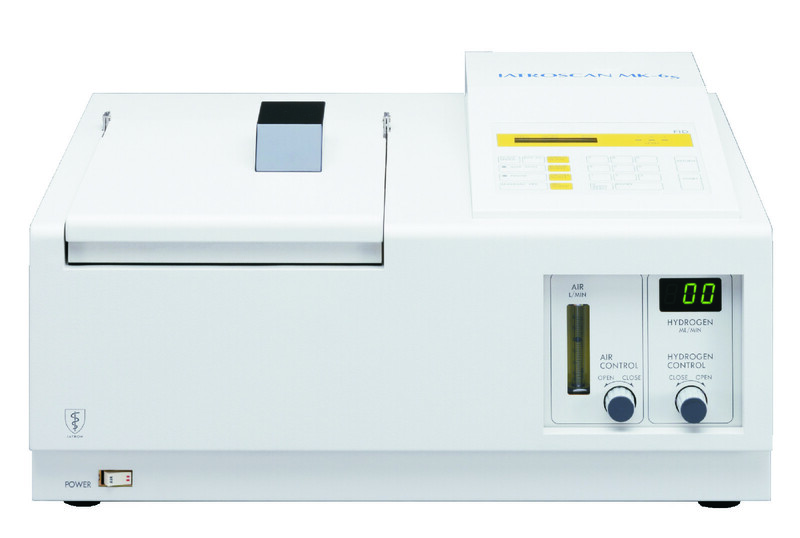 The IATROSCAN MK-6s combines the techniques of thin layer chromatography (TLC), an established technique for the separation of organic compounds, with a flame ionization detector (FID). A specially designed Chromarod® (a quartz rod coated with a thin layer of silica or alumina on which the sample is developed and separated), is advanced at a constant speed through the flame of the FID, the substances are ionized through energy obtained from the hydrogen flame. Effected by the electric field applied to the poles of the FID the ions generate electric current with an intensity proportional to the amount of each organic substance entering the flame. The analysis with IATROSCAN MK-6s is favorable in maintenance and price, because of the low consumption of solvents and the reusable Chromarods®. The Separation is made with the TLC Method on so called Chromarods® and the Detection with a Flame Ionization Detector (FID). With an additional FP-Detector it is possible to analyze sulphur and phosphorus, too (MK-6).The Analysis is made with different complementary accessories. The spotting of the sample is made with a specially developed Application System (Autospotter or Full-Automatic-Sample Spotter) on the 10 Chromarods® lying in the Rod Holder. The Chromarods® are developed in a special Development Tank. After the separation of the substances the Holder is put in the IATROSCAN. The Chromarods® are scanned through the Hydrogen flame. The collector, which is placed above the flame is generating an analogue signal, which is evaluated with a PC and the SES-i-ChromStar® Software. The TLC/FID Analytical System IATROSCAN MK-6(s) was developed for the Analyzing of organic Substances, which show no UV-Absorption and no Fluorescence, and give difficulties by analyzing with GC. If you like more Informations of the Iatroscan please click here and fill out the follow sheet.